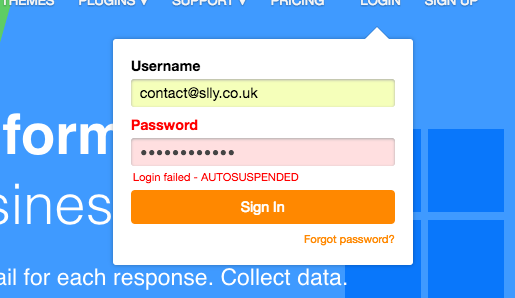 Can't access my account, receiving a message that says "login failed - account autosuspended"
Please can you let me know what is wrong with my account. I get the above error message when logging in and my links say they have been disabled. There are several sensitive form fields mentioned in "Phishing" section, which are prohibited to use according to our terms. Add a sort agreement and/or an e-signature field to the form, so your customers will agree to provide their Driver's License along with personal info. In the meantime, I have removed that field from your form and reactivated your account.